#4 - Pirate Life Pale Ale Pirate Life shocked Australia with their three core beers all placing in the top 11 in last years Hottest 100. This beer is a cracker with sweet caramel malts helping to balance out big grapefruit flavours and bitterness from the hops. #18 - Coopers Pale Ale The ubiquitous Coopers Pale Ale deservedly found it's way into the Top 20 of last year's Hottest 100. Every Australian beer lover has had a Coopers (Green) Pale at least once and knows that the house yeast is what makes the beer. You've been living under a rock if you don't know what this tastes like! #24 - Nail Red Nail's Red was the first beer in the countdown that I hadn't tried before. It's quite an impressive Red Ale with nice deep caramel malts being beautifully complimented by hops that provide grapefruit and tropical fruits, with passionfruit the most prominent. It has a slight bitterness to it, but is definitely more of a traditional Red Ale than an U.S. influenced one. #37 - Mash Copy Cat This was another quite impressive beer. It's not the hoppiest IPA out there, but it's certainly not bad. The hops give most resinous pine and zesty citrus characteristics and are just kept in check by the chewy caramel malts. It's not the prettiest looking beer, but it's certainly one I wouldn't be upset at having again. 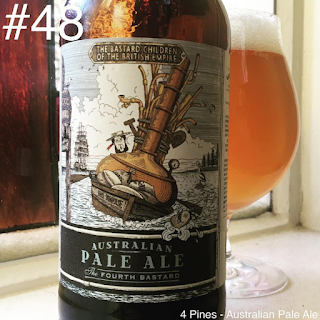 #48 - 4 Pines Australian Pale Ale It would be pretty harsh to judge this beer on the tasting I had of it in 2016... Dylan found this beer in the back store room at work and it had not held up well over the 20 or so months since it was brewed. When I tried it fresh in early 2015 it was a pretty good Pale Ale, sort of reminiscent of a Coopers Pale with some extra hops chucked in. #58 - Two Birds Golden Ale I was really quite disappointed when I tried this beer. It had a lot of residual sweetness from the malts, while there was little to no hop presence. The thought crossed my mind that this may have just been an off bottle (it was well within date) and a subsequent trip to the brewery to try it on tap proved it to be far less sweet than the bottled version I'd tried. #65 - Stone & Wood Garden Ale One of a growing number of craft mid-strength options on the market, Stone & Wood's Garden Ale clocks in at 3.5% ABV. It's reminiscent of English styles with plenty of earthy maltiness, whilst the hops are predominantly floral and grassy and provide little bitterness. Personally it's not my thing, but I can see the appeal - it's a very easy beer to drink. #80 - Little Creatures Rogers Speaking of better mid-strength offerings; Little Creatures Rogers is just that! Stylistically this beer sits somewhere between English Bitter and American Amber Ale. If that sounds weird picture a mix of earthy/nutty malt, which melds with some spicy floral and citrus hops. I think this beer gets overlooked far too often, it's a wonderful beer in the right situation. #84 - Mountain Goat Barrel Breed Barley Wine I was really excited to see a Barley Wine make the cut for the Hottest 100. This was a seriously impressive Barley Wine with wonderful complexity, It was packed full of dark fruit flavours, as you'd expect, and had nice warming booze elements - not the overpowering harshness that you can sometimes come across. This one is absolutely worth the price tag. #95 - 3 Ravens 55 Last but not least for this installment was the 55 American Pale Ale from 3 Ravens. It's named 55 because it's brewed with 5 malts and 5 hops, initially for the brewery's fifth birthday. It's a Pale Ale that I really enjoy drinking, with nice bitterness from the floral and citrus hops. With any luck I'll get these last three posts knocked out by the end of next week All the posts are now up on the Beeroclockau Instagram page, so please feel free to check them out if you can't wait until the next installment. Once these get finished I'll get into some new content, including a long overduce Carwyn Beer-Thusiast Pack review.